Eighteenth-century France: Rogue Denis de Beaulieu (The Girl from Rio's Richard Stapley) is carousing in the Red Lion pub when he is accosted by Turec (Vera Cruz's Charles Horvath) over his bad manners. A brawl turns deadly when Denis fires a loaded musket at Turec in self-defense. On the run from Turec's friends and the law, Denis becomes lost in the forest and comes across an iron door which opens for him only to close after him with no seeming means of opening it. He finds himself in the forbidding castle of aristocrat Alain de Maletroit (Witness for the Prosecution's Charles Laughton) who intends for Denis to marry his niece. Although the offer of a pretty wife but unlimited funds should be irresistible for a "gambler, wastrel, libertine only two steps from the guillotine," Denis resents the loss of his freedom and knows that Maletroit's generosity comes with more strings. When Denis tries to leave, preferring to take his chances with the mob outside, Maletroit's men forcibly show him to his room; whereupon, the extent of Maletroit's ruse to get him to the castle is revealed when Turec turns up to be paid. When Maletroit's niece Blanche (While the City Sleeps's Sally Forrest) sneaks into his room to warn him, Denis is pleased to discover that she is not the toothless hag he assumed was intended for him but also surprised to learn that she is as opposed to the marriage as he, having promised herself to suitor Armand. When they both present their feelings to Maletroit, he insists that they are indeed perfectly suited to one another but then reveals to trusted servant Corbeau (The Man on the Eiffel Tower's William Cottrell) just how pleased he is that they dislike one another ("Hatred will come later"). Blanche is just as puzzled as Denis as to why her uncle would insist on such a union, telling him that her uncle has never mistreated her but that everything that has been near and dear to her has nevertheless been snatched away. Visiting the dungeons of the castle that were once the lair of a legendary French inquisition torturer, Maletroit reveals his true plans to his brother Edmond (House of Wax's Paul Cavanagh) who has been shut away in a cell for twenty years, intending to ruin Blanche with a marriage to a scoundrel. Maletroit only regrets that Edmond has been driven mad by his imprisonment and cannot understand him, but that is a ruse and Edmond beseeches his only remaining faithful servant Voltan (Cauldron of Blood's Boris Karloff) to make sure that the union does not happen. Unaware of Denis' true character and intentions, Voltan leads Denis into the dungeons ostensibly to a secret means of escaping the castle. An adaptation of Robert Louis Stevenson's short story "The Sire de Maletroit's Door", The Strange Door is frustrating in that it has some interesting ideas but is nevertheless Universal-International filler as the company attempted to recapture the genre from its poverty row competitors (eventually finding a modicum of success with their William Alland science-fiction ventures of the mid-fifties starting with The Creature from the Black Lagoon and It Came from Outer Space before descending into budget-conscious shabbiness). The production values of this period film are modest with cramped but eclectic castle sets (possibly redressed and recycled for The Maze) and the costumed extras raiding the Universal wardrobe department and stock music, but it is truly the script that is the film's weakness. While the Production Code surely prevented the film from doing more than hinting at Maletroit's libertinage living in a "secluded domain" where "villainy binds men together," and any too lurid details of the dungeon, there are too many characters used to little effect seemingly motivated more by the need to get the most out of Universal player contracts however pleasing it is to see them onscreen – from the ambiguous role of Corbeau as servant, disciple, and needling voice of conscience to footman Talon (Curse of the Undead's Michael Pate) who endures Maletroit's insults, humiliation, and table scraps seemingly while waiting for a more tempting bribe, or Denis' potential ally in wedding guest Count Grassain (Batman: The Television Series' Alan Napier) – while Denis and Blanche falling in love is as poorly handled as the idea that Blanche has suspected nothing wrong while living in the castle for all of her twenty years, serving only to upset Maltroit's plans and effect the climax. Laughton is excellent in a role that requires scenery chewing while the rest of the cast do their best with too little (if The Body Snatcher was Karloff's best post-Universal golden age horror role then this film is his least, even compared to his dignified turns in mostly beneath him American International product to come) while Universal's contract technical crew includes art director Nathan Juran who would begin his directing career with the following year's The Black Castle (also with Karloff and scripted by The Strange Door's Jerry Sackheim). Like Juran, jobbing director Joseph Pevney's feature career would peter out at the end of the fifties – despite high-profile assignments like Female on the Beach, The Man of a Thousand Faces and Tammy and the Bachelor – and he would move onto episodic television and made-for-television movies. 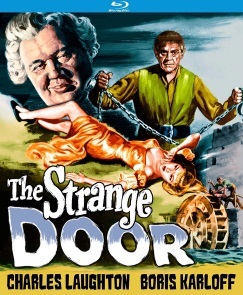 Released theatrically by Universal-International, The Strange Door was one of the Universal horrors bypassed for VHS in the early eighties when MCA was exploiting their better-known titles from the thirties and forties, not becoming available on home video until 1996 with an MCA Encore Edition laserdisc Karloff double feature with the 1944 Technicolor flop The Climax and a standalone VHS release. The film first came to DVD in 2006 with Universal's The Boris Karloff Collection – pairing the film with the aforementioned The Climax and The Black Castle along with Night Key and Tower of London (followed by a standalone Universal Vault Series DVD-R in 2013). Kino Lorber's 1080p24 MPEG-4 AVC 1.33:1 pillarboxed fullscreen is likely derived from the same HD master. The blacks are not as deep as they should be and the highlights may lose a bit at their whitest while a newer 4K or 2K scan might've made more of the variegations of grey in-between, but this is to be expected of Universal's monochrome catalogue titles, not quite as good as their remasters of the classic horror titles but not as problematic as some of their older HD masters of color titles. The sole audio option is a DTS-HD Master Audio 2.0 mono track which boasts clear dialogue, effects, and music - although the stock tracks are undistinguished - and is clean of any overly distracting hiss, crackling, or pops. Optional English SDH subtitles are included. Besides trailers for other Kino Lorber titles - the Laughton starrers Witness for the Prosecution and The Paradine Case, the Karloff starrers Black Sabbath and The Crimson Cult, and Pevney's Female on the Beach, the only extra is an audio commentary by film historians Tom Weaver, David Schecter, and Dr. Robert J. Kiss with typical exhaustive research by Weaver. He notes that the film was the studio's return to horror and provides some intriguing speculation on just how the Stevenson source story which amounted to a "medieval shotgun wedding" was turned into a genre film by noting that the studio had earlier announced a remake of Karloff/Lugosi 1935 film The Raven and drawing parallels between that film and The Strange Door which might have started out as said remake (also noting the presence of characters named Talon and Corbeau). He also suggests that it may have been Laughton himself who emphasized his libertine character's gay affectations while his interviews and research address other rumors about Laughton dating back from his previous Karloff collaboration in The Old Dark House (Laughton's American debut through Universal when his intended debut on through Paramount's Devil and the Deep was delayed). He also draws from interviews with Forrest and Stapley who thought little of the film – with Weaver also noting that comparisons of Stapley in action here to Douglas Fairbanks Jr. led producer Ted Richmond (Nightfall) to announce the intention to dust off some old Fairbanks films for remake with Stapley that never came to fruition (Stapley would change his name to Richard Wyler and work in Europe before losing interest in acting). Schecter comes momentarily to comment on the sources of the film's score through various Universal stock music cues including Hans J. Salter's memorable theme from The Wolf Man. The Strange Door is frustrating in that it has some interesting ideas but is nevertheless Universal-International filler as the company attempted to recapture the genre from its poverty row competitors.